Jack Rabbit Blueberry Duffin Nic Salt E-Liquid | Electronic Cigarette Co.
Blueberry Duffin nicotine salt e-liquid from Jack Rabbit is blueberry muffin crossed with blueberry doughnut. This flavour has been created to take all of the good parts of a freshly fried doughnut and a baked muffin straight from the oven and mixing the two together. In Jack Rabbit's words: "That is what we have created in this flavour. 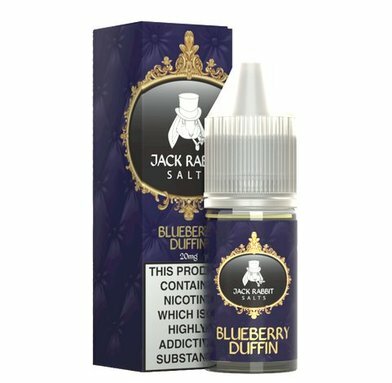 Juicy, sweet, fresh blueberries added to a perfect mix of light, fluffy muffin and a sweet doughnut base. The careful balance between desserts and fruits makes this flavour perfect for all vapers."